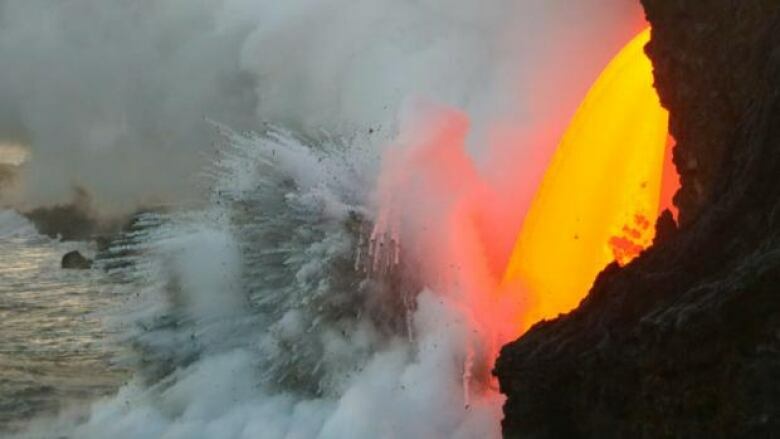 New video from the U.S. Geological Survey reveals a torrent of lava spewing into the ocean from a Hawaiian volcano. The video shows the massive stream of lava — which is about two metres wide — from the Kilauea Volcano on the Big Island of Hawaii as it flows into the Pacific Ocean. "At Kilauea's ocean entry on Jan. 28 and 29, the interaction of molten lava flowing into cool seawater caused pulsating littoral explosions that threw spatter [fragments of molten lava] high into the air," the USGS said in its report. "Some of these incandescent clasts fell on top of the sea cliff behind the ocean entry, forming a small spatter cone. During one exceptionally large burst, spatter was thrown about twice the height of the sea cliff." The Puʻu ʻOʻo eruption of Kilauea began in 1983. Since then it has added 220 hectares to the island.